Its the final session of Cooking with Coffee from BUNN! 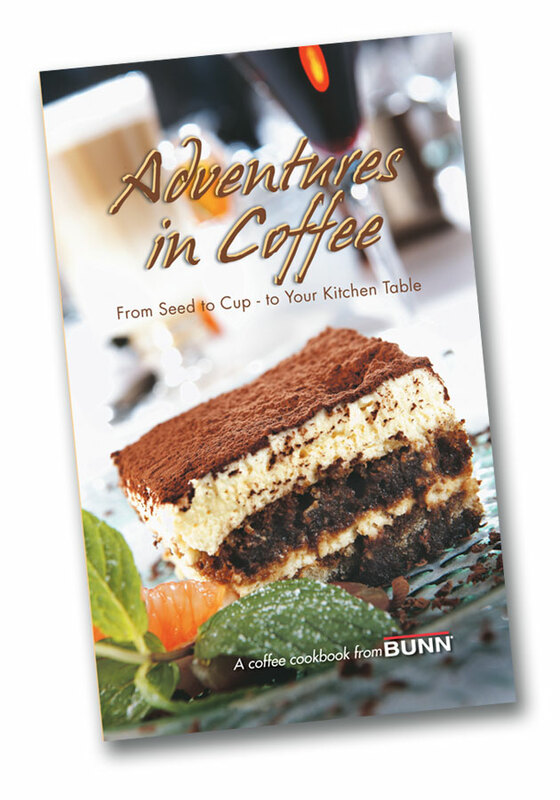 So dont miss your chance to win an Adventures in Coffee cookbook. To enter the drawing comment on the question listed at the bottom of this blog post by midnight on November 29! Bon Apptit! Jordan Coffey, executive chef at American Harvest restaurant in Springfield, Illinois, offered us some very yummy recipes that incorporate coffee. (Yes his last name is Coffey. How fitting!) Chef Coffey likes to experiment with food. 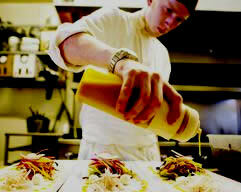 He started his culinary career while working at Augies Front Burner where his passion for food was ignited. Jordan has also worked as a sous chef at numerous restaurants in Chicago. Now as the executive chef of American Harvest he aims to create American cuisine with a twist using local and seasonal ingredients. When it comes to cooking with coffee, he replied theres a million things you can do, from incorporating coffee into savory dishes to using it in pastries and desserts. Chef Coffey says desserts are really easy to incorporate coffee. A dessert on the American Harvest menu is a chocolate peanut butter stout cake served with coffee syrup. He says this coffee syrup is easy to make and can be used on a variety of dishes. To create your very own coffee syrup, simply take left over brewed coffee, add a couple of cinnamon sticks and sugar. Then place this mixture over a low flame and watch it very closely until it is reduced to a syrup. Another easy coffee dessert recipe from Chef Coffey is diplomatico. Diplomatico is a pound cake dipped in brewed coffee, grilled and served with whipped cream and berries. To prepare this dessert at home he suggests purchasing a pre-made pound cake from your local grocery store. Cut the pound cake into slices, and place the slices in the freezer for approximately 15 minutes to allow the pound cake to stiffen up. While allowing the pound cake to stiffen up, mix 2 to 1 ratio of brewed coffee and espresso and add sugar to taste. Remove the stiffened pound cake from the freezer, and dip the cake into the coffee mixture. Once dipped, lightly grill the cake. Serve with whipped cream and fresh berries! If you want to try coffee in a savory dish, use it as an ingredient in rubs for meat. One of his personal recipes for a rub is a combination of coffee grounds, sugar, smoked paprika, a little bit of nutmeg, salt and a lot of black pepper. He has used this rub on short ribs, but he says it could be used on ribeyes, filets, or any preference of meat! A recipe that he recently served at his restaurant was a coffee BBQ sauce glazed quail. This BBQ sauce is a little thinner than normal BBQ sauce. To create this at home take brewed coffee with a little bit of espresso and reduce it down. Add a little molasses, brown sugar, vinegar, tomato paste, salt and pepper. Whether you decide to try to experiment with coffee in desserts or in savory dishes, Chef Coffey advises to exercise caution when adding coffee to recipes as it can become bitter very easily. To avoid this, add sugar even if you are making a sauce for savory dishes. QUESTION: WHAT TYPE OF DISH DO YOU WANT TO TRY TO INCORPORATE COFFEE INTO, A DESSERT DISH OR A SAVORY DISH?